This 4-Cheese Italiano Chicken Bake only takes 10 minutes to prepare, thanks to canned cream of mushroom soup, a pre-shredded blend of 4 cheeses and STOVE TOP Stuffing. This easy chicken casserole recipe will become a family fave. Prepare stuffing as directed on package. Mix soup and wine until blended. 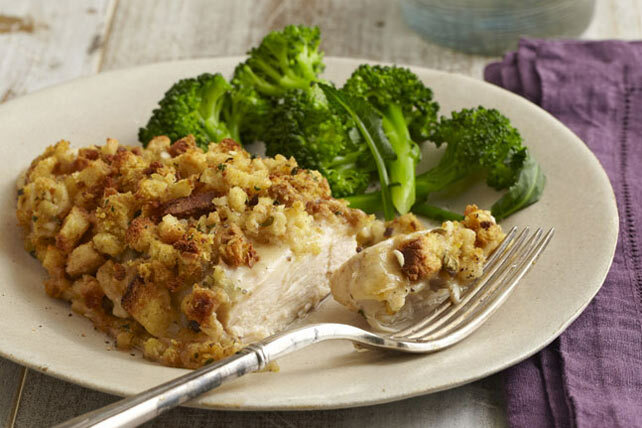 Place chicken in 13x9-inch baking dish; top with cheese, soup mixture and stuffing. Bake 30 min. or until chicken is done (170ºF). Substitute chicken broth for the wine. Always cook chicken until well done, not medium or rare. If using a meat thermometer, the internal temperature should register at least 170ºF when the thermometer is inserted into the thickest part of the poultry.